When having one just isn’t enough you get a Baker’s Dozen. Baker’s Dozen tastes like a yummy cupcake with vanilla frosting topped with blueberries. When this flavor enters your mouth it’ll feel like it’s your birthday but you won’t feel sad celebrating by yourself because you can take as many cupcake puffs as you want. The vanilla frosting will coat your tongue with a wave of sugar that will allow the essence of blueberries to easily slide down your throat. Plus, you’ll want to sink your teeth into its warm soft bread but when you bite down all you’ll feel is smoke. The blueberries are so juicy and divine but blended with the sweet vanilla gives it an extra creamy taste which makes it the perfect ornamentation for this cupcake. Baker’s Dozen comes from The Chubby Baker who owns the yummiest bakery in town. They’ve been known to produce premium dessert treats that always use the highest quality of ingredients while handcrafting each formulaic blend with love. When you were younger you always wanted enough money to eat all the treats your heart desired now that you're older you just want a stomach that can handle all the treats you can buy. This flavorful concoction will finally let you live out your desert fantasies. You’ll be able to vape this flavor all day long without ever getting sick of it. Not to mention, it won’t add a single pound when you step up on to your scale. When you’re done the scent will linger in your mouth as a nice reminder of this pleasant vaping experience. 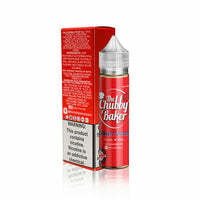 Every day can be your birthday with a bottle of Baker’s Dozen by The Chubby Baker E Liquid.